The Green Council worked towards the 4th Green flag for sustainable travel. The Council was visited by An Taisce travel officer Imelda Ryan Jones who surveyed staff, 1st year and Transition year students to see how everyone got to and from school. A very high number of staff and students currently travelled by car, but we hope we have made some changes and improvements. 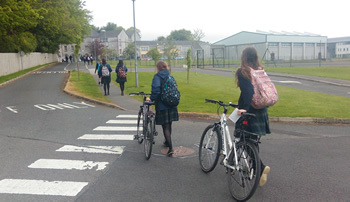 In April, we liaised with the County Council regarding safe walking routes for students, and have contributed to improved road safety for students by adding reflective strips to the school jacket. We organised a Green Travel Day in May whereby students and teachers were encouraged to use more environmentally- friendly ways of travelling to school. The Green Council hopes that this will raise more awareness of sustainable methods of travelling to school and will help to remind everybody that each one has a part to play in the conservation of our environment.